Jumia Mobile Week 2017 is the hottest mobile sell season in Nigeria and this year’s mobile week is packed with even more exciting activities. During this week, Jumia Nigeria, in collaboration with big guns in the mobile and telecommunications Industry offers a lot of mouthwatering deals on mobile devices. 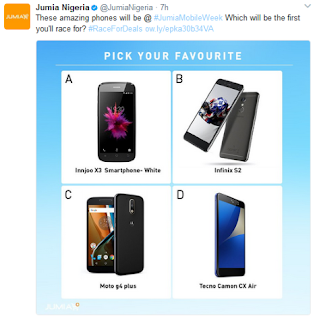 This year, Jumia Nigeria will be featuring top brands like Infinix, Innjoo, Tecno, Motorola, Samsung and more, to bring the best of these Manufacturer’s devices to consumers at deals that are simply irresistible. The Jumia Mobile Week 2017 will run from Monday, April 24th 2017 to Sunday, April 30th 2017. It promises to be BIG and filled with amazing DISCOUNTS! As for lovers and fans of Infinix Phones all over Nigeria, you can be sure of up to 40% discount on top Infinix smartphones during the Jumia Mobile Week 2017. Motorola products will enjoy up to 50% discounts on select products (that is half price). Tecno and Innjoo lovers be expecting 20% discount on select products in Nigeria during Mobile Week 2017. A lot of new Smartphones and gadgets will be launched and made available at the store and there will be flash and discounted sales. Among of the new Smartphones that will be unveiled and made available on Jumia Nigeria for your orders are Tecno Camon CX Air and Infinix S2. 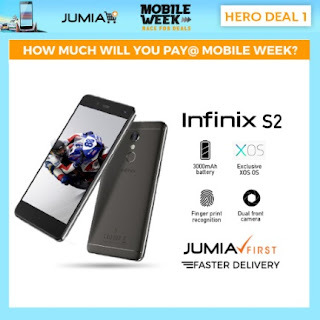 The Tecno Camon CX, Infinix Zero 4, Innjoo X3, Moto G4 Plus, Huawei Y3, iMose X-1 Pro are among the Jumia Mobile Week deals, coming up with cost reduction. More new smartphones will be added before the date, while we anticipate the release, let's take a peek at the features of the above listed. 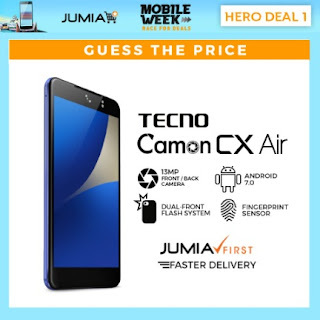 Tecno Camon CX Air is a stripped variant of the Camon CX. It is the same size as the CX, but has some feature alterations. The Tecno Camon CX Air is one of the slimmest smartphones around at just 5.6mm thin. It is also camera focused with a 13MP camera on the rear and front. The device will be launched during the Jumia Mobile Week! The never before seen Infinix S2 is coming to the mobile week! It's new, awesome and the very first of it's kind! It is the world’s 1st ever Wefie, fingerprints recognition and an exclusive XOS OS! Infinix S2 features trendsetting dual front cameras and the smartphone industry’s first ever application of an ultra-wide angle of 135° plus 8.0 megapixels for the front cameras, leading selfie taking into a new era of Wefie. Check out its full specification here. The Innjoo X3 is one of the most pocket-friendly smartphones available 2 months ago. It is one of the cheapest phones from Innjoo that is currently available across Nigeria. At the time of writing this article, the phone costs about N18,000 in the Nigerian currency and it is currently available for purchase from Jumia Nigeria, SEE DEAL HERE. There will be a discount, so be expecting price slashed on Innjoo X3 during Jumia Mobile Week 2017. The Innjoo X3 comes with everything a typical Android phone should come with but in lower specifications, the device crams a 4.0 inches screen with a resolution of 800 pixels by 480 pixels. The X3 device uses a 512MB RAM with a 4GB internal storage space which is expandable via SD card to up to 32GB. Motorola Moto G4 Plus smartphone was launched in May 2016. The phone comes with a 5.50-inch touchscreen display with a resolution of 1080 pixels by 1920 pixels at a PPI of 401 pixels per inch. The Motorola Moto G4 Plus is powered by 1.5GHz octa-core Qualcomm Snapdragon 617 processor and it comes with 2GB of RAM. The phone packs 16GB of internal storage that can be expanded up to 128GB via a microSD card. As far as the cameras are concerned, the Motorola Moto G4 Plus packs a 16-megapixel primary camera on the rear and a 5-megapixel front shooter for selfies. The Motorola Moto G4 Plus runs Android 6.0.1 and is powered by a 3000mAh nonremovable battery. It measures 153.00 x 76.60 x 7.90 (height x width x thickness) and weigh 155.00 grams. The Moto G4 also has a water repellant feature – it just means that if you splash liquid on your phone, or get caught in the shower with it, it will not break down. Motorola Moto G4 Plus is currently unavailable at any of the Nigeria online stores. Stipulate to be available during Mobile Week. Motorola G4 Plus in Nigeria is expected to range from N45,00 to N6000, but guess what? 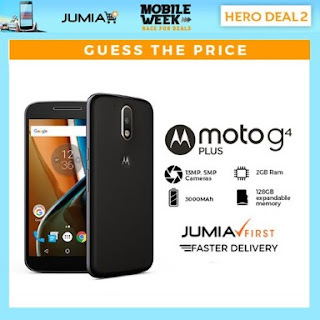 The price of it may be greatly reduced to 25k or 30k since the Jumia promised up to 50% discount on Motorola selected products. 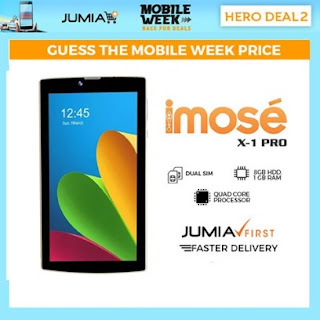 iMose X-1 Pro is among the Jumia Mobile Week deals. Features a7-inchh display screen runs on Android 5.1(lollipop) operating system with a high speed of 1.2GHz quad-core processor which support multitasking and seamless performance.. it comes with 1GB RAM and 8GB ROM which allows for apps download. The X-1 Pro Tablet supports 3G, 4G and Wifi networks‎ which allow it serve as both a phone and computer with its numerous applications. The ultra-clear HD display with a widescreen ratio allows you fully enjoy movies and videos‎. It has a dual sim functionality. Don't miss the Huawei Y3 at Jumia Mobile Week. Don't miss the incredible 4G LTE connectivity and 5MP, 2MP cameras for your selfies. Don’t want to miss out Mobile Week Reloaded? ✓ Be the first to get access to top deals via pop notification, from hours between 9:15 to 10:15 am and 5:15 to 6:15 pm (Jumia Mobile Week 2017 Appy Hour). Download the Jumia app via your Android or iOS devices. Interested in the mobile week? So many brands are coming, it is only 1 day and few hours to go. Jumia is set to reward your patience with AH-mazing discount soon! Save the money and Save the date! Get prepared to upgrade for less during!